This chelonian is a grazing species of tortoise that favors semi-arid, thorny to grassland habitats, although some leopard tortoises have been found in rainier areas. In both very hot and very cold weather they may dwell in abandoned fox, jackal, or anteater holes. Leopard tortoises do not dig other than to make nests in which to lay eggs. 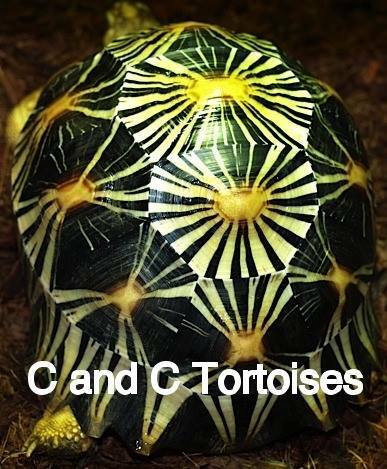 The skin and background colour are cream to yellow, and the carapace is marked with black blotches, spots or even dashes or stripes. However, in mature adults the markings tend to fade to a slaty, nondescript brown or grey, commonly tinged with the local dust. We housed our baby leopard tortoises in large, custom-made glass enclosures; 1.5 x 0.6 meters (5 x 2 feet) for babies, 2.2 x 1.2 meters (7 x 4 feet) for juveniles and 2.8 x 1.5 meters (9 x 5 feet) for adults. Our enclosures are around 0.45 meters (1.5 feet) tall. To keep humidity up, we covered the enclosures in plexi glass and used under tank heat pads directly under their hides. Our adults are housed in large, custom-made melamine enclosures. During the summer months, we put our leopards outside during the day. We use bottomless, stainless steel dog runs that we connect together to create a huge area for grazing and basking. We move the outside pens daily to allow the torts to graze on fresh grass and weeds. For our baby and young leopard torts, we used upside-down Tupperware or Rubbermaid bins with a hole cut into a side for an opening. As previously mentioned, we use under tank heat pads under our hide boxes to keep humidity up inside. We don’t use hide boxes for our adults due to their size and the fact that ambient humidity in our reptile room is consistently high. We’ve tried different substrates over the years but prefer coarse grade coconut husk. It holds moisture well and is mould-resistant. It’s also less messy than soil or fine grade coco coir and doesn’t get in their eyes or stick to their food. We keep our substrate dry to moist but never damp or wet. We use mercury vapour bulbs to provide UV and heat during the day. We hang several 160-watt bulbs into their enclosures, approximately 0.3 meters (0.9 feet) above the tortoises. During the night, we use 150-watt infra red bulbs for heat. These are also hung approximately 0.3 meters (0.9 feet) above the torts. All lights are on timers; the daytime bulbs are on from 8am to midnight and night time bulbs are on from midnight to 8am. It’s important to provide a temperature gradient for the tortoises. Our temp gradient ranges from approximately 27 ºC (80 ºF) on the cool end to approximately 49 ºC (120 ºF) directly beneath the basking bulbs. Our leopard tortoises bask directly under these bulbs at various times throughout the day and night. During the summer, our leos spend their days outside in the natural sunlight. Leopard tortoises drink a lot of water daily and should always have access to fresh, drinking water. We also soak our leopards several times a week and have done this their entire lives. This ensures they stay well hydrated and keeps their enclosures clean, as they usually defecate and urinate during their soakings. Humidity in our reptile room fluctuates between 60-70%. To keep humidity up, we mist the substrate and carapaces of the tortoises at least once a day. When the tortoises were young, we placed under tank heat pads directly beneath their hides. Moisture evaporating from the substrate maintained approximately 90% humidity inside the hides. We feel high humidity is very important to ensure smooth shell growth. Our leopard tortoises have been fed the same way their entire lives. The majority of their diet consists of dark, leafy greens (dandelion, different varieties of kale, collard greens, watercress, yam leaves, grape leaves, etc). We also feed copious amounts of cactus pads. We feel cactus pads are the closest thing to being a perfect food for all species of tortoises. We go through approximately 10-15 lbs of cactus a week for our adults. For babies, we scrape off the spines and diced the cactus into little pieces. For adults, we scrape off the spines and offer the pads whole. We also feed vegetables regularly, their favorites being pumpkin, squash, carrot and yam. We feed all veggies raw. Rarely, we will offer fruit to our leopards, usually cactus pear fruit, papaya, melons and berries. Occasionally, we offer processed food. The ones we give our leopards are Mazuri and Mazuri LS and ZooMed Grassland. We supplemented our babies with calcium with D3 and Herptivite. For adults, we supplement exclusively with Repashy Super Veggie and occasionally organic spirulina. During the summer, our leos consume huge amounts of grass, clover and other weeds from our lawn. We don’t handle our leopard tortoises, per se, with the exception of moving them to their soaking bins and outside enclosure and offering daily chin scratches and head rubs. Our males are more personable and our females are somewhat shyer. However, our leopards are all very interactive and will run over to greet us. We’ve hand fed them morsels of food daily since they were hatchlings and they’ve grown into extremely outgoing, charming and very trusting adults. We spot clean our enclosures daily for food, faces and urine. We do entire substrate changes whenever necessary, usually every two to three months. 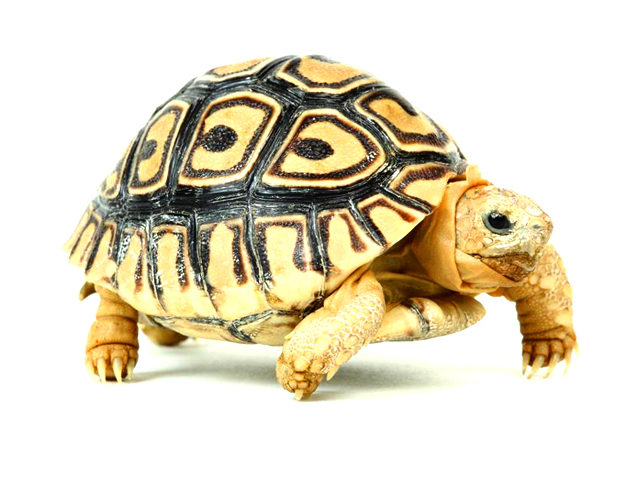 Leopard tortoises are generally a very hardy species if the proper environment is provided. Babies and juveniles should have access to a humid hide box to minimize pyramiding. Leopards during all stages of their lives should be kept very warm to hot. Cool temperatures and high humidity is a lethal combination for leopards, leading quickly to respiratory problems and eventually death.